We didn't travel anywhere over our Christmas-New Year holiday break this year. Since we were just planning to be at home, I knew I needed to have some kind of little project to engage the children in. (Just at home + No routine + More than a day or two = Recipe for Disaster. Please tell me this is true at your house too?) We also hadn't done any cookie baking in December, just too many other things going on. The solution: the New Year's Cookie Basket project. 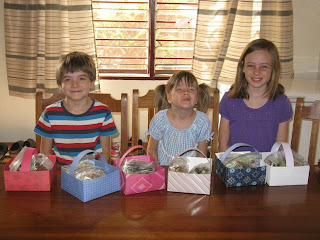 The first stage of the project was that each child got a 'baking day' with me. 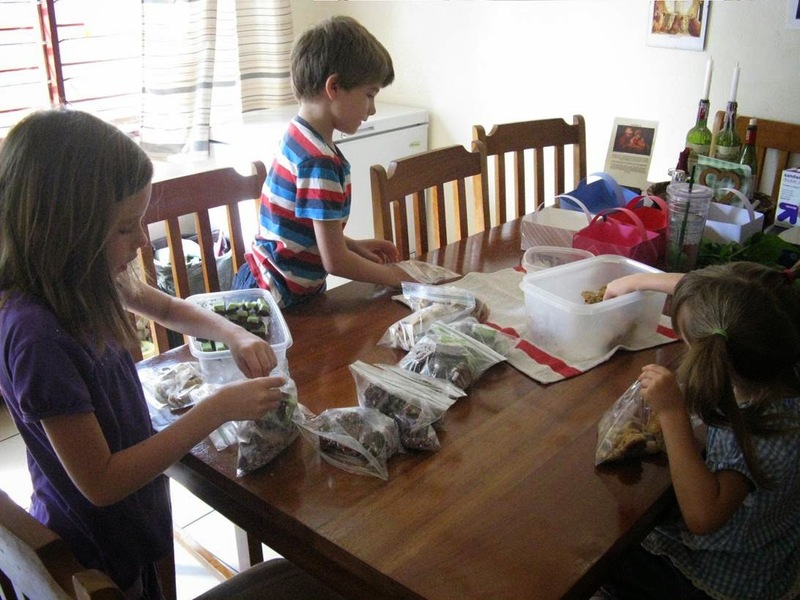 On their designated day, we made a big double-batch of a Christmas cookie of their choice. (I also made pan of mint fudge to round out the choices.) The first 3 dozen of each we set aside, the rest were for general family consumption. I rarely bake (I have an aversion to unnecessary messes in the kitchen and turning the oven on when it's hot, which it nearly always is in Africa), so this was a special treat for everyone. Learning their way around the kitchen is an important life skill too, and this was a fun way to get some more kitchen experience in. The second stage of the project involved making little baskets from fancy scrapbook paper. I modified the instructions from one of the projects in Paper Sloyd: A Handbook for Primary Grades. (My modifications just made the dimensions of the boxes a little larger than the one in the book.) 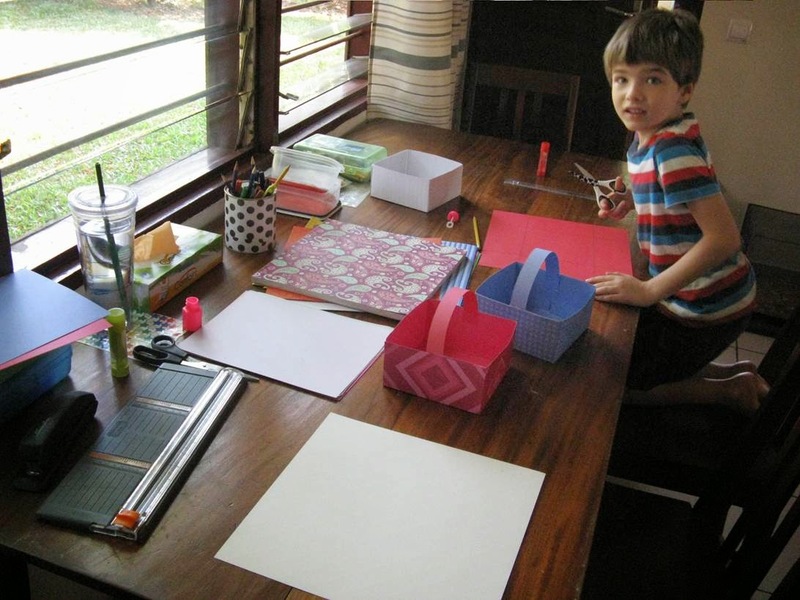 Paper Sloyd involves cutting and folding paper to make useful items of various types. Each child made two baskets. Well, the two older ones made them. I did most of the work for Elizabeth (age 4) although she helped with the glue and choosing the paper. So there you go - a fairly simple handicraft project for the not-so-crafty Mama. We had so much fun with this one, we might need to make it one of our holiday traditions. I *love* how you combined the paper sloyd and the baking--this is a fabulous idea, Jen! 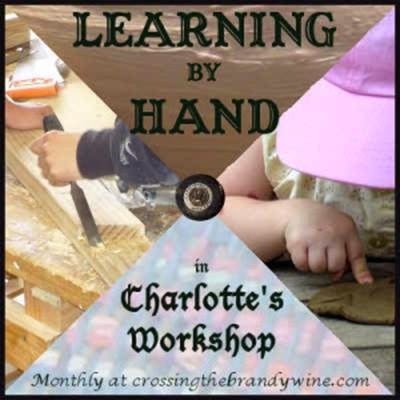 I really need to make time to do this project with my kids...maybe for Valentine's Day? I agree - home skills, math, crafts and generosity all in one post! It is surprising how much fun paper sloyd is, and the book you linked makes it so easy to figure out. I really like these. :) I've have Paper Sloyd on my Kindle and can't wait to try a few things. This post is inspiring! I am going to do this year instead of the typical plates we put our cookies on for neighbors. Could you tell me what dimensions you used for your basket?